As we’re at the end of the calendar year and a shade over halfway through the season, here’s another update to the scatter graphics, which compare the attacking and defensive performances of every team in a division. Each of the four graphics is explained briefly below and at length here. 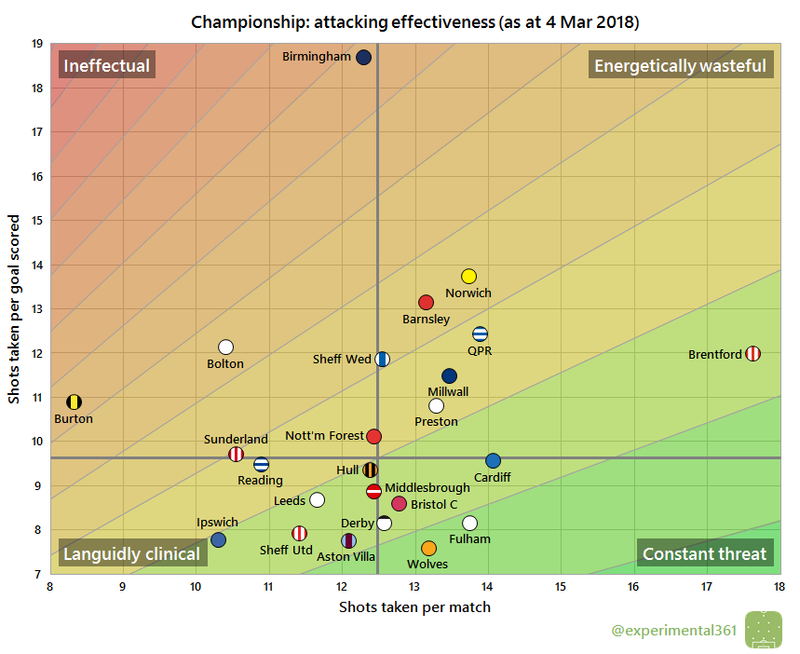 Brentford are creating way more chances than anyone else this season and they’re looking pretty tidy in defence too. 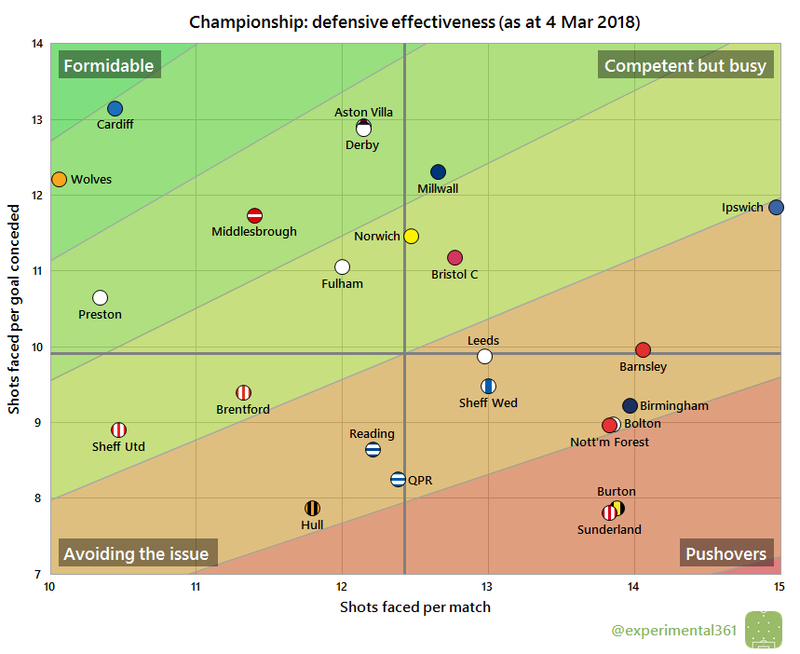 Runaway leaders Wolves look better in defence than attack, with Cardiff and Preston profiling similarly well. 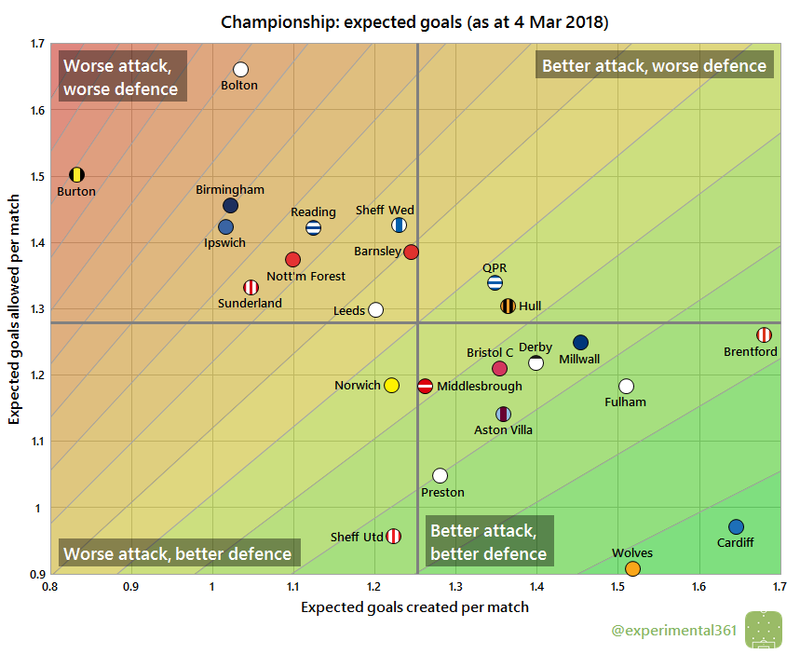 Burton and Ipswich look to have been on the back foot the most this season, with Bolton and Sunderland also looking pretty poor at both ends of the pitch. Birmingham‘s finishing has been graphic-stretchingly bad: almost twice as wasteful as the average side. While Wolves don’t create an insane amount of chances they’ve been the most ruthless finishers. 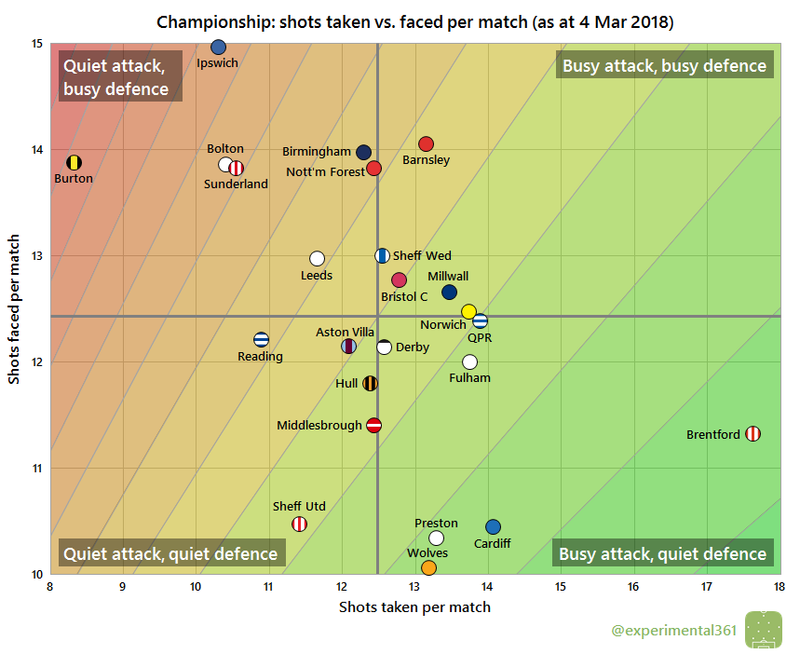 Brentford‘s industrious attacking has often been without reward: their inconsistent finishing means that they’ve only scored one more goal than Sheffield United despite firing in over six more shots per game. Cardiff and Wolves have both looked very tough to break down this season, although Ipswich have absorbed almost as many shots for each goal conceded. However the Tractor Boys have had to deal with more attempts at their goal than anyone else. Hull‘s poor season can be explained by their porous defence – only bottom side Sunderland have soaked up fewer shots for each goal conceded. When we adjust for shot quality, Cardiff actually look to be edging Wolves slightly overall, so the title race may not be over yet. Nobody else has been close to those two: Brentford can match them in attack and Sheffield United can in defence, but not the whole package. Both Burton and Bolton look to be struggling more than the rest of the division, with the Brewers’ attack some way off the rest of the division while the Trotters’ defence has looked by far the most vulnerable.